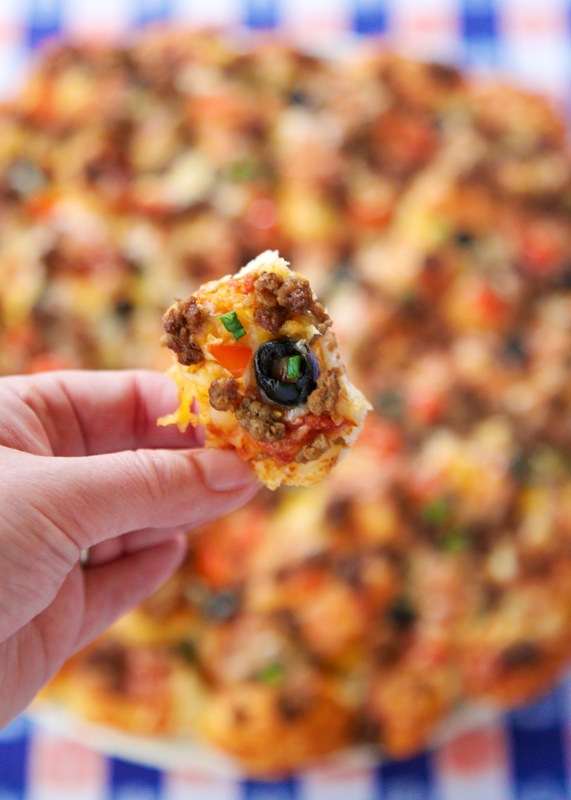 Mexican Pull Apart Pizza - refrigerated bread dough, topped with taco sauce, taco meat, cheese, olives, tomatoes and green onions. Great for a party or quick lunch or dinner. Kids (and adults) go nuts over this pizza! This a version of one of the most popular Football Friday posts from last year, Pull-Apart Pizza. It was so good and extremely popular. This year I switched up the flavors and made a Mexican Pull-Apart Pizza. I made a quick taco sauce for the base of the pizza and topped it with Mexican cheese, taco meat and some veggies. It was crazy good! This is easy to transport to the tailgate party, and the pizza tastes great warm or at room temperature. This pizza didn't last long at our tailgate. Everyone loved it. I love that you can customize the toppings. 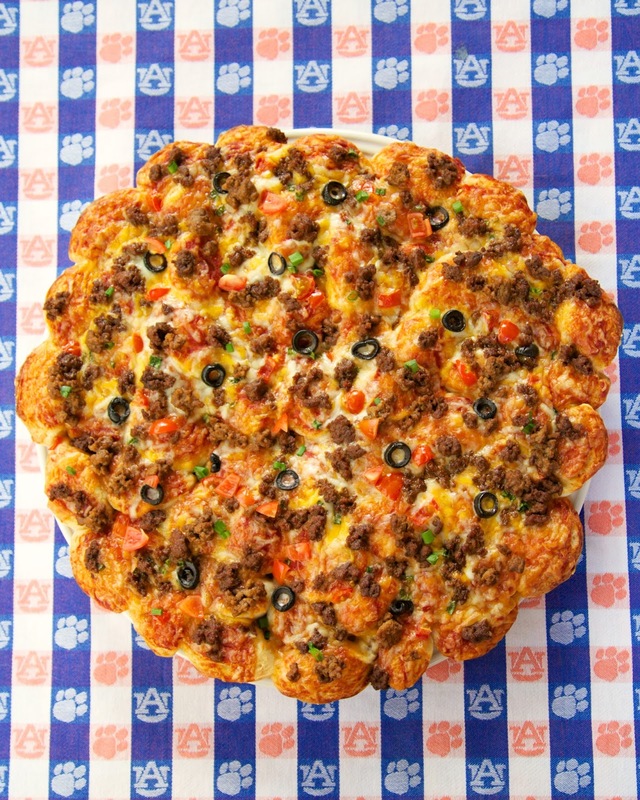 If you don't tailgate, this pizza is great for lunch or dinner. We've had it for tailgating, lunch and dinner. It is definitely a keeper! In a small saucepan, combine tomato sauce, salsa and half of taco seasoning. Simmer for 5 minutes and remove from heat. In a small skillet, brown ground beef. Drain fat; add remaining half of taco seasoning and water. Simmer for 5 minutes. Remove from heat. Place one loaf of refrigerated dough on cutting board. Cut dough in half lengthwise. Slice each dough half crosswise into 16 slices for a total of 32 bread dough slices. Repeat with remaining dough. You will have a total of 64 bread dough slices when you are done. Arrange dough slices on pizza pan or PIZZA STONE. Top with taco sauce, cheese, taco meat and veggies. Bake 14–16 minutes or until crust is golden brown. What size is your pizza stone? I have one from Pampered Chef, probably a common size. 64 pieces of dough sounds like a lot! This looks really good! I have the pampered chef stone too. Not sure what size it is - 16 or 18 inches is my guess. I'm out of town so I can't measure it.